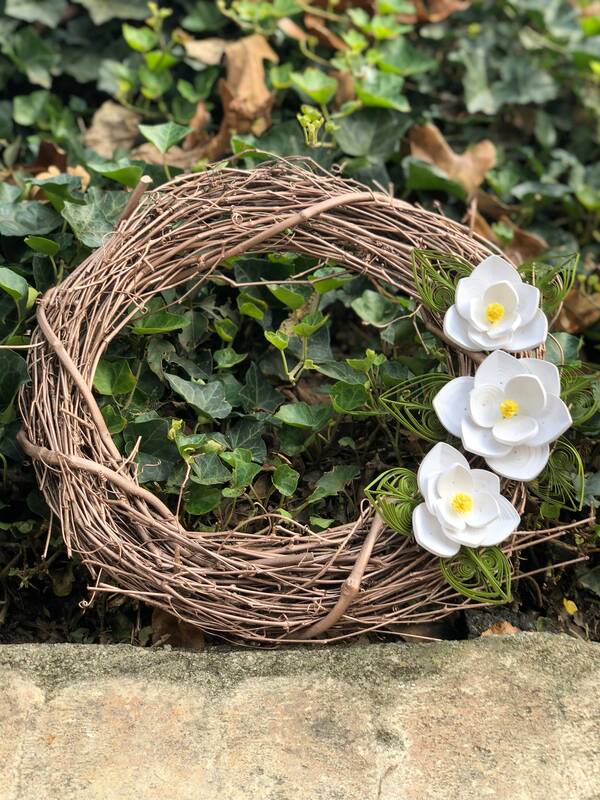 Quilled Magnolia Floral Wreath on Grapevine Handmade Paper Flowers 14"x14"
Give your guests a southern inspired welcome with this charming Magnolia wreath! This is a gorgeous 14"x14" grapevine wreath with handmade quilled paper Magnolia flowers. The flowers are sealed with a clear sealer to enhance durability. This type of wreath would be ideal for a covered area out of direct sunlight and rain. Perfect for an apartment entryway or even as an indoor wreath! This would also be wonderful as an inside fall decoration! This would be perfect housewarming gift! Please ask any questions before you purchase. This is a one of a kind handmade item ready to ship!